How can I lower my companies costs? Businesses use cost control methods to monitor, evaluate, and ultimately enhance the efficiency of specific areas, such as departments, divisions, or product lines, within their operations. Cost Control is reviewing both fixed and variable costs, and attempts to reduce expenses. Inventory is a variable cost that can be reduced by finding other suppliers to offer more competitive prices. It may take longer to reduce fixed costs, such as a lease payment, because these costs are usually fixed in a contract. Cost Control strategies are necessary to preserve corporate profits and to maintain or gain a competitive advantage. Cost control is a continuous process that begins with the proposed annual budget. The budget helps: (1) to organize and coordinate production, and the selling, distribution, service, and administrative functions; and (2) to take maximum advantage of available opportunities. As the fiscal year progresses, management compares actual results with those projected in the budget and incorporates into the new plan the lessons learned from its evaluation of current operations. The main benefit of putting cost controls in place is lowering your company’s overall expenses. You can limit the amount of money different employee levels can spend, keeping more money from going out the door. This will allow your company to keep more cash on hand, or to invest larger amounts of money in other ways, such as in capital expenses or paying down debt. Cost-control management can help you clearly identify activities running smoothly and staying within budget from the ones constantly breaking down and consuming extra dollars. 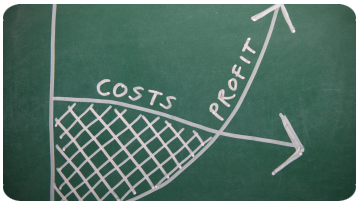 Cost control is an important factor for maintaining and growing profitability. Outsourcing is used frequently to control costs because many businesses find it less expensive to pay a third party to perform a task than to take on the work within the company and, the expertise most often does not exist within the organization. As standards are developed from the study of cost operations and existing conditions, they become a pointer to the weaker aspect of operation. The efficiency or inefficiency can be ascertained easily by comparing actual and standard costs. Because of standards, cost control exercises influences all the factors of operation. Measurement, comparison, and evaluation of current performance become more effective. It helps in cost reduction by putting effective check over inefficiency in operations and by eliminating undue paper work. It suggests standard cost accordingly. Budgets are prepared on the basis of standard costs. Thus, budgeting and standard costing together provide effective control device and make managers cost conscious.